NAIROBI, Kenya (AP) — A decision by extremist Islamic militants to ban delivery of food aid and a "normalization of crisis" that numbed international donors to unfolding disaster made south-central Somalia the most dangerous place in the world to be a child in 2011. The first in-depth study of famine deaths in Somalia in 2011 was released Thursday, and it estimates that 133,000 children under age 5 died, with child death rates approaching 20 percent in some communities. 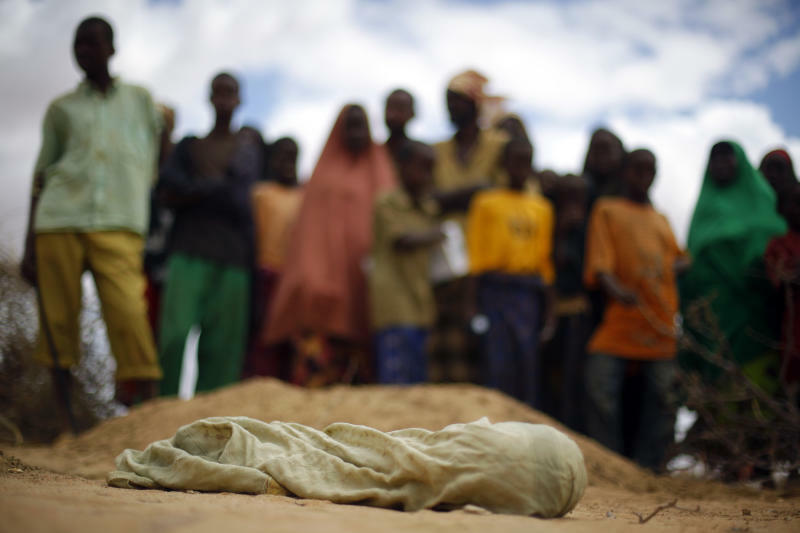 That's 133,000 under-5 child deaths out of an estimated 6.5 million people in south-central Somalia. That compares to 65,000 under-5 deaths that occurred in all industrial countries in the world combined during the same period, a population of 990 million, said Chris Hillbruner, a senior food security adviser at FEWS NET, a U.S.-sponsored famine warning agency. "The scale of the child mortality is really off the charts," Hillbruner said in a telephone interview from Washington. FEWS NET was one of two food security agencies that sponsored the study. The other was the Food Security and Nutrition Analysis Unit - Somalia. The two agencies had warned the world as early as fall 2010 that failed rains in Somalia meant a hunger crisis was approaching. "The world was too slow to respond to stark warnings of drought, exacerbated by conflict in Somalia, and people paid with their lives. These deaths could and should have been prevented," said Senait Gebregziabher, the Somalia director for the aid group Oxfam. The new study put the total number of famine deaths at nearly 260,000. The Associated Press first reported the death toll on Monday, based on officials who had been briefed on the report. In March 2011 some 13,000 people died from famine, the study found. In May and June 30,000 people died each month — at least half of them children. The U.N.'s formal declaration of famine didn't happen until July. Why was there such a slow humanitarian response? One reason Hillbruner indicated was the feeling that Somalis are always suffering. "I think that one of the key issues is that there was this normalization of crisis in south-central Somalia, and that I think the international community has become used to levels of malnutrition and food insecurity in southern Somalia that in other parts of the world would be considered unacceptable," Hillbruner said. In Washington, U.S. State Department spokesman Patrick Ventrell said the hardest-hit famine regions were controlled by the extremist Islamist group al-Shabab. "Al-Shabab's inhumane blockage of humanitarian assistance prior to and during the famine, including banning dozens of humanitarian organizations from providing lifesaving assistance, thwarted a more rapid international rapid humanitarian response that could have saved even more lives," Ventrell said. "And equally, al-Shabab's refusal to allow affected populations to leave al-Shabab-controlled areas prevented them from seeking assistance elsewhere." The study was conducted by Francesco Checchi, an epidemiologist at the London School of Hygiene and Tropical Medicine, and Courtland Robinson, a demographer at Johns Hopkins University. It drew on 200 mortality surveys by the Food Security and Nutrition Analysis Unit , including 61 from the famine period, and data on food prices, wages and humanitarian access. Philippe Lazzarini, the chief U.N. humanitarian coordinator for Somalia, said in a video news conference from Mogadishu Thursday that the death toll was shocking and sobering. He said the report confirms that aid groups should have done more before famine was declared — by which point 120,000 people had already died. Lazzarini also noted that more than a dozen aid groups were banned from operating in south-central Somalia by al-Shabab, a hardline anti-West political decision that made saving lives "extraordinarily difficult." He said that in the months before famine was declared the crisis did not receive the amount of attention it should have, in part because of a lack of access because of al-Shabab. "The famine was almost a silent drama of tragedy," he said. "It was not on the news. Media did not have access. Agencies did not have access. The extraordinary challenge of access explains why the early response, despite the early warning, did not really take place." Ken Menkaus, a Somalia expert at Davidson College, said some elements of al-Shabab bear major responsibility for famine deaths, but that other factors contributed as well, including a corrupt Somali central government and general insecurity that made travel in Somalia dangerous. Thousands of Somalis walked dozens or hundreds of miles to reach camps in Kenya, Ethiopia and Mogadishu, the Somali capital. Countless numbers of families lost children or elderly members along routes that became known as roads of death. Somalia has made great progress since the famine ended in February 2012. Al-Shabab has been forced out of Mogadishu and now controls far less territory than it once did. The government appears more capable than the Transitional Federal Government in place during the famine, but challenges like child mortality and food security remain. Gebregziabher said a global conference on Somalia which will be held in London next week should encourage investment in long-term development to ensure the country does not suffer famine again. Associated Press reporter Matthew Lee in Washington contributed to this report.